Darlene is a web contributor, specializing in the CRM, Social, IT Management and ERP segments. She has several years of experience covering the software technology world, writing about the latest companies and trends and interviewing the founders of emerging and innovative technology companies. ParAccel CEO Chuck Berger discusses the business benefits of big data analytics and how ParAccel’s platform enables organizations to effectively analyze data for business improvement and growth. Large vendors like Oracle and SAP have started to realize that their traditional systems may no longer cut it. But, their solution offerings weren’t built with the innovative technologies currently seen in the marketplace today. So, how have these tech titans responded? By acquiring the hottest names in the social and cloud segments. Socialcast powers a secure enterprise social network that brings together people, information, and applications to improve collaboration and communication. When people think of business software, Oracle often comes to mind. A leader in both computer hardware and enterprise ERP, CRM and SCM software systems, Oracle is the third largest software provider by revenue, behind Microsoft and IBM. Oracle’s place in the business software world is prominent. This prominence, while helping Oracle maintain its position as a leading software provider, also means that Oracle has had its fair share of bad press and legal wrangling with other software and technology titans. Workbooks CEO John Cheney discusses how Workbooks helps SMEs gain a complete view of their business, why CRM projects fail, and how Workbooks sets itself apart from other cloud CRM offerings. What are the top 5 data warehousing software vendors and their market shares? According to Gartner's Magic Quadrant for Database Warehouse Management Systems, Teradata, Oracle, and IBM lead the market with EMC and Sybase not far behind. n our Nimble Q&A, CEO Jon Ferrara shared his insights about how social media has transformed customer relationships and how Nimble empowers this new paradigm of CRM. 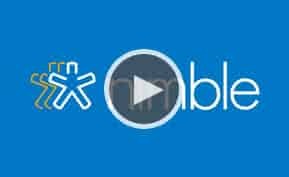 In this Deep Dive, take a closer look at how Nimble really works. Scroll through the slideshow below to see Nimble in action. Can anyone recommend a real-time accounting system that is scalable and runs on the cloud? Hi Jack, If you're looking for a cloud-based accounting system, you have a few options such as Intacct, Acumatica, and FinancialForce.com. Our Top 15 Accounting Software Report includes more vendors that might be of interest to you. Which ERP programs are available as cloud-hosted solutions? Hi Rowena, There are many different ERP programs that are available on the Cloud; the right one for a particular business will depend on that business' requirements and needs. That said, a few of the leading cloud ERP solutions include NetSuite, Microsoft Dynamics, and SAP Business ByDesign. President and CEO Don DeLoach shares why Infobright, a top Big Data software solution, puts a cult-like focus on machine-generated data to help companies gain a better understanding of their data. Which accounting software works best for Department of Defense contractors that provide services and products? In addition to Tenrox mentioned below, I would also take a look at Deltek Costpoint, which is built specifically for government contractors and comes with extensive accounting, compliance, and project management features. What are some CRM solutions that work with Google Apps including Gmail? Hi Sue, There are quite a few CRM solutions that work with Google Apps, including Zoho. Other solutions like Insightly and Capsule CRM also offer Google Apps integration. You can find a longer list at the Google Apps Marketplace too. What is the best CRM tool for client profile management that integrates with Zendesk for an 8-10 employee company? Zendesk integrates with many different CRM tools, including BatchBook, GetSatisfaction, Highrise, Microsoft Dynamics CRM, NetSuite, Salesforce, Solve360, SugarCRM, and TactileCRM. These solutions would all be suitable for a small business, depending on its needs, and they all also include client and contact management features. Read our week in review wrap-up of major news items from July 30 - August 3, 2012, with announcements from Google, Dropbox, HP, Oracle, and Salesforce. Learn how to avoid CRM implementation failure with these cautionary tales and tips to create a successful CRM implementation strategy. What is the best alternative to Remedyforce, ServiceNow, and Nimsoft in the ITSM segment currently? Depending on your needs, there are a variety of alternatives to Remedyforce, ServiceNow, and Nimsoft. You could take a look at HP Service Manager, FrontRange ITSM, Cherwell, or ChangeGear to name a few. What is the best online solution to process and receive payments, do bookkeeping, and invoice the customer? Hi Daniel, I'd suggest taking a look at FreshBooks, which is an online accounting solution built with all those features. I'm currently using Sage BusinessWorks. Can I manage inventory with QuickBooks? Depending on which version you use, both Quickbooks Online Plus and Quickbooks Premier include inventory management features. Can you recommend a CRM solution compatible with the MYOB payroll/accounting solution? Hi Barry, Both Legrand CRM and youGROW CRM are compatible with MYOB and are available as add-on products to their accounting solution.